All are hand made from exotic wood (I am assured that no endangered trees are used). They are a work of art to your eye and feel like silk in your hand. These pencil-style rug hooks are available in three hook sizes: fine, medium and large (medium pencil hooks are currently out of stock). 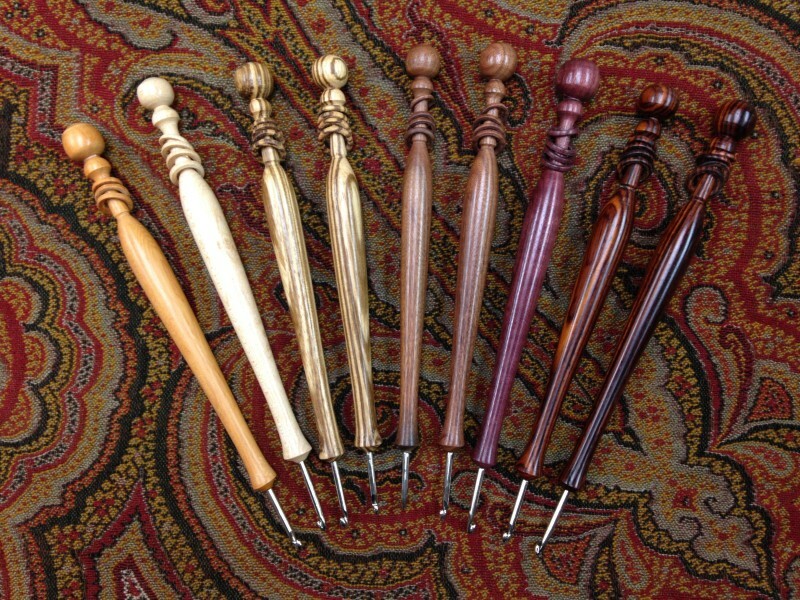 The hand carved handles have rings at the top which have a pleasant, soothing rhythm while you are hooking. Wood currently available: Pacific Yew, Birds Eye Maple, Zebrawood, Pau Ferro, Purple Heart, Rosewood. Please indicate your choice of wood in the “notes” section of the shopping cart.